We need to catch this person - please help us! 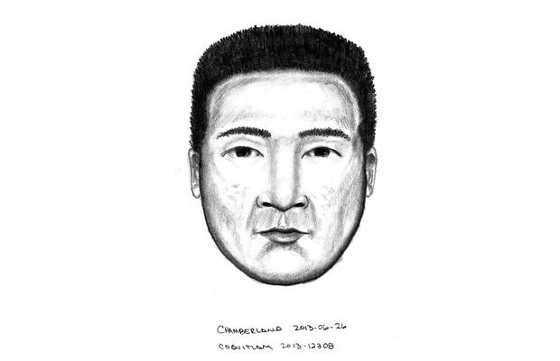 Coquitlam Mounties released this sketch of the man investigators believe is behind an assault of a realtor in Port Coquitlam. The British Columbia Real Estate Association is offering a $10,000 reward to anyone with information that leads to the apprehension and conviction of the man who assaulted a realtor in Port Coquitlam in May. Coquitlam RCMP released a detailed sketch of the suspect earlier this week, hoping it would generate tips. The attack took place on May 4, when the victim was hosting an open house on Rowland Street. The realtor was assaulted before she was able to convince the suspect to leave. She did not suffer any serious physical injuries. "Thankfully, these incidents are rare, but they do happen," said BCREA CEO Robert Laing said in a release. "Realtor safety is an important area of concern for all of us in the real estate profession." The reward will be available through July 18, 2014. Anyone with information is asked to call Coquitlam RCMP at 604-945-1550 or Crime Stoppers at 1-800-222-8477.